We're in to chapter 9 on this piece. Alice is playing croquet with the Queen when the Cheshire cat drops in and begins causing a scene. The Duchess, who was arrested, is called for because the Cheshire cat is hers but in the confusion the Duchess merely walks off with Alice in tow as the King of Hearts and the Executioner try to find the cat to behead him. Alice is amazed at how calm and pleasant the Duchess is considering their first meeting she was everything but and assumes it was the pepper the Duchess had in her soup and thus thinks that pepper is unnecessary in soup and that it makes people angry just as things like barley sugar make people sweet. Gotta love this kid's logic. In the very center we have Alice, still holding on to her flamingo, being drug off by the now very calm Duchess who means to scoot away before everyone remembers she's supposed to be in jail. In the Duchess' hand is a pepper shaker that reveals a ring of pepper showing the Duchess angry to hint that the pepper's the cause. 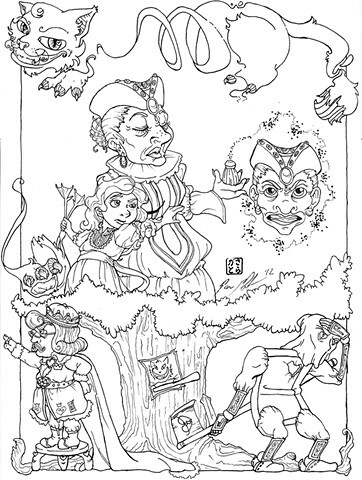 Below are the King, left, and Executioner, right, looking for the Cheshire with a tree between them with a "wanted" poster with an axe just below the neck. The Executioner is meant to be some horrid hybrid between card soldier and human. Above is the Cheshire cat, amused at the chaos, playfully pretending he's been beheaded by making half his body disappear. One paw is just above the King's head, showing he really wants to stir the pot.